in their Easter baskets. Hanging the flags around our garden has become a tradition in our family. The prayer flags are beautiful and an easy way to create merit. Every time the wind blows, our positive thoughts for the earth and its creatures are dispersed throughout the cosmos. Hanging prayer flags in honor of deceased loved ones, including pets, has also become a family tradition. 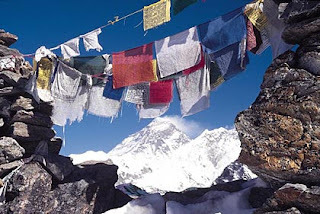 My favorite place to purchase prayer flags online is through Tibetan Treasures, which is based at a nearby gompa. In addition, Tibetan Treasures is a great resource for children’s books.